A top for the tarmac. 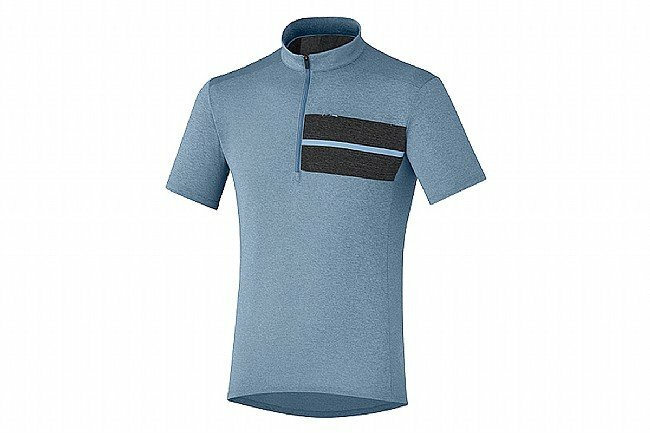 Staying comfortable around town is key for making you a regular commuter, and Shimano's Transit Pavement Jersey ensures you'll stay both comfy and stylish day in and day out. Lightweight polyester is moisture-wicking and quick-drying for easy transitions from the bike and into the office, and odor-reducing technology helps keep you feeling fresh. A zippered hidden rear pocket lets you store some food or a wallet without looking out of place once you step off the bike, and a zippered chest pocket provides additional storage if needed. 100% polyester. Discrete Reflectivity accents increase visibility in low light. Chest 37"-38" 38½"-39½" 39¾"-42" 42"-44½" 44¾"-47¼"
Waist 32¼"-33¾" 34¼"-35¾" 36¼"-38" 38"-39¾" 39¾"-42"
Hips 37"-38" 38½"-39½" 39¾"-42" 42"-44½" 44¾"-47¼"
I like how it doesn't look out of place if you wear this going into a restaurant. No one wants to do everyday activities looking like a Tour de France wannabe. So that's the good part. But, the lack of pocket space is severely hampering the usefulness of this jersey. You wont find the standard triple back pockets here. There is only a tiny zipped space in the back large enough for maybe keys. The front pocket won't fit a phone either. Kind of disappointing.